I’ve always been a fan of “custom excerpts” in WordPress rather than either showing the entire post or letting WordPress make a teaser based on the beginning of the post. Recently a colleague called this into question saying “Last I heard, Google understands and doesn’t count those [meaning the auto-generated teasers] as duplicate content”. To me, the question itself is a result of an overly Google-centric view of content. The main reason I like them is because I think they improve the reader experience. Nevertheless, I also think that crafting custom excerpts still has potential value to help in Google. Ditto the “Read more” link at the end of the excerpt. 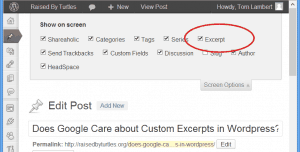 What is a custom excerpt? By default, the front page of a WordPress site and other listing pages will show whole posts. Unless you have very short posts, this makes it really cumbersome for site visitors to scroll through your listing pages to see what posts you’ve written lately (front page listing) or on a given topic (category listing). So a first-level solution is to take just an excerpt of the post, grabbing the first 55 words (by default). This is better, but often the first 55 words are not a good summary of the post. Enter the custom excerpt. With a custom excerpt, you create text that isn’t drawn from the post at all, but is a description, a teaser, call to action to read the rest (or maybe to not read the rest if the post doesn’t have the information the visitor is looking for). This text will now appear in your listings and in your RSS feed if you choose. So you can offer a better experience to your readers by crafting a summary that truly summarizes. How do I create a custom excerpt? 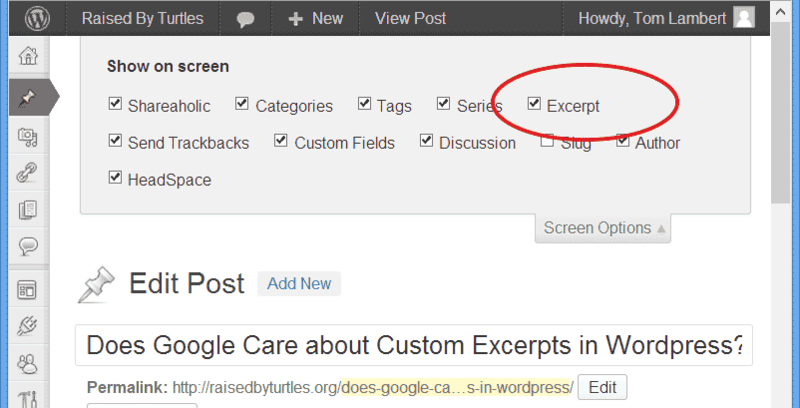 The excerpt field is built into WordPress, but as of Worpdress 3.1, you have to use the Screen Options to enable the excerpt field. Once you do that, you’ll have an excerpt field at the bottom of the post edit form and you simply write whatever makes your heart sing into the text area on your edit screen. At this point, to get it to show, you just need to make sure that your theme uses the_excerpt() instead of the_content() as explained in the WordPress Codex. But does a custom excerpt have any value? It makes it easier to scan your listing pages. Rather than filling the page up with whole posts, making it very long and oh so laborious and tiresome to scroll, especially on a small screen, you have a compact listing that the busy reader can quickly scan. You might say that a short teaser automagically pulled from the post text does this too, but it doesn’t, because of reason #2. It allows you to provide the information the reader needs at that point. When reading the post listings, the site visitor is in a grazing mode. You’d like to get that person to a reading mode, but she’s not there yet. If she were, she’d be engrossed in a full-length post somewhere or sitting on the toilet reading a 10,000-word article in The New Yorker. But she’s actually skimming your post listings, so you need the excerpt to be a grazing interrupter. Shouldn’t the opening of my post be a grazing interrupter too? Maybe, but let’s say that today I’m feeling literary. 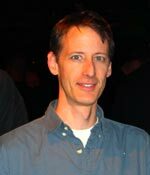 I start my post with a nice anecdote that, though maybe funny compelling as a read, is a poor invitation to read the post. A first sentence has only one job: to get someone to read the second sentence. An excerpt, however, has a different job: it is to guide readers to the most relevant content and entice them to click. Those may overlap, but they may not. So the custom excerpt gives me a chance to meet the reader where she is right now (i.e. not on the page) rather than where she will be if she clicks through. Okay, but I really meant does it have any value in Google? Now we’re back to my friend’s query. My initial reaction is to say that starting with that question is indicative of an overly Google-centric approach to content, but then, we aren’t starting with that question, we’re ending with it. Specifically, she said that she had heard that Google did not count as dupe content the auto-generated excerpts that regurgitate post content (implying that therefore there’s no problem with regurgitating post content). A penalty: Google actually hates us. It has determined that we are a spammer, scraper and, unforgivable sin (cover young eyes and ears here), a violator of Google Webmaster Guidelines. In this case, Google is actively squelching our site. Google is our enemy. A problem: Google likes us, but doesn’t understand us. We have terrible URL canonicalization and have the same content on ten different URLs. In this case, Google is trying to be our friend and sort this out for us. It wants to help. It tries to help. It does its best to figure out which page is the “real” page, but Google is, after all, still a relatively dumb set of computers and it can’t to do it perfectly (though it has gotten very good at it). So sometimes our rankings don’t live up to their potential. This used to be a major problem with WordPress listing and archive pages, but Google has gotten good at recognizing the archive pages. Unless something else is seriously jacked on the site, I rarely see an archive page outrank the canonical page anymore. 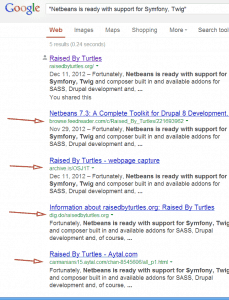 Google ignores those pages. A missed opportunity: Google would like is if it knew us but Google doesn’t know us because we haven’t taken the time to introduce ourselves. We have all sorts of words in our heads, but we’re kind of lazy. So the words are still in our heads and, despite their best efforts and ongoing research projects, Google still can’t enter our heads. So it’s stuck with what we have on the page. If it’s not on the page, Google remains a stranger that passes in the night. The custom excerpt address the last situation, the missed opportunity. The missed opportunity is optimizing to level 2 and being satisfied that Google ignores us. 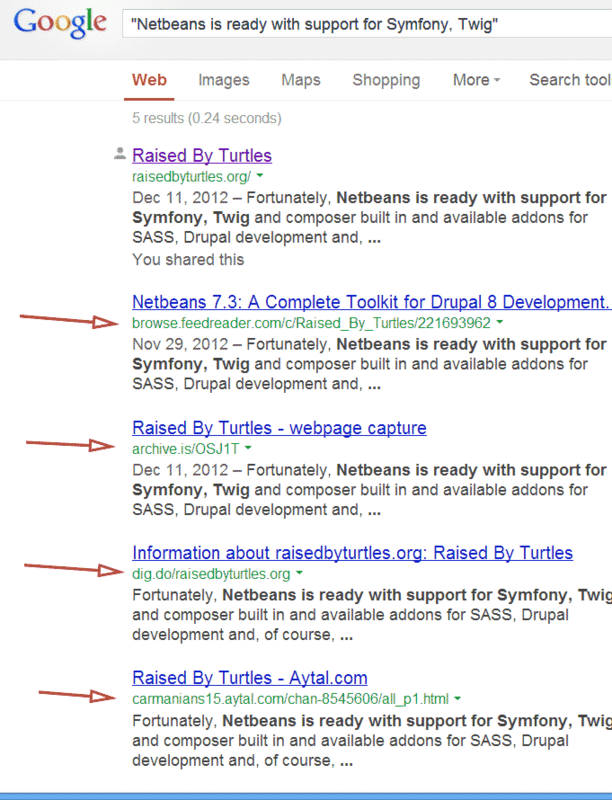 Hey, if Google ignores the content, it’s not a dupe content problem is it? Correct. It’s a missed opportunity. It’s giving up on the chance to put something unique on those pages that Google just might care about. Notice what has happened here? I am indexed in Google for a term for which I would not otherwise be indexed. I rank #1 for the term, but the rest are all RSS services picking up my feed, so I effectively own an entire page for that either directly, or in a two-click approach. Those RSS services will never outrank the main page itself for the key phrases on that page because the RSS feed doesn’t have those phrases. It has only the key phrases that are in the excerpt. So though I don’t consider this important for ranking in Google, I do think it has value. Is that all? Didn’t you say something about the Read more link? So I did. This is basically the same logic. The primary purpose of a custom Read more is to guide the reader, entice clicks and otherwise be more useful than a generic Read more link. In this case it is even more user-centric because this will always be at least the second link to the same URL (the first usually being the link via the post title). That means that Google will probably discount the anchor text, though probably still “see” the words, just not as anchor text (though I haven’t tested that). If you want to implement custom Read more text, just download the far-ranging and fantastic (yes, fantastic) Headspace2 plugin (sadly no longer maintained, but functioning quite well still in June 2013). So go forth and write great excerpts!